President Bush blamed the monthlong conflict on Hezbollah, Iran and Syria. WASHINGTON (CNN) -- President Bush declared Lebanon a front in the "global war on terrorism" Monday, equating the Israeli battle against Lebanon's Hezbollah guerrillas to the U.S.-led wars in Afghanistan and Iraq. Bush said the U.N. resolution that took effect early Monday was an "important step that will help bring an end to the violence." 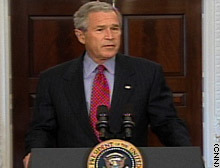 "Hezbollah suffered a defeat in this crisis," Bush said during a news conference at the State Department. "There's going to be a new power in the south of Lebanon," he said, referring to the U.N. force that will assist the Lebanese army in taking control of the area. "How can you claim victory when you were a state within a state in southern Lebanon, and now you're going to be replaced by an international force?" he said. Speaking after a day of meetings with Pentagon and State Department officials, Bush said the leaders of armed groups must choose between armed conflict and democracy. He warned Iran against meddling in both Lebanon and Iraq, where U.S. troops are battling a persistent insurgency and trying to stave off a Sunni-Shiite civil war more than three years after the 2003 invasion. "In both these countries, Iran is backing armed groups in the hope of stopping democracy from taking hold," he said. "The message of this administration is clear: America will stay on the offense against al Qaeda. Iran must stop its support for terror," he said. "The leaders of these armed groups must make a choice: If they want to participate in the political life of their countries, they must disarm." The president defended the U.S. role in settling the Israel-Lebanon conflict, saying Secretary of State Condoleezza Rice deserved "great credit" for the cease-fire agreement. The administration resisted international calls for an immediate cease-fire, which it said would not have addressed the underlying causes of the conflict. "We want peace," he said. "We're not interested in process. We want results." Bush laid the blame for the conflict -- in which more than 1,000 people died -- on Hezbollah, Iran and Syria. "America recognizes that civilians in Lebanon and Israel have suffered from the current violence, and we recognize that responsibility for this suffering lies with Hezbollah," Bush said. "Responsibility for the suffering of the Lebanese people also lies with Hezbollah's state sponsors, Iran and Syria." Bush said Iran "provides Hezbollah with financial support, weapons and training." "Iran has made clear that it seeks the destruction of Israel," he said. "We can only imagine how much more dangerous this conflict would be if Iran had the nuclear weapon it seeks." The United States maintains that Iran is pursuing nuclear weapons. The Iranian government says its nuclear program is intended solely for peaceful purposes.